One of the things that is cool about vintage patterns is that, like cookbooks, they often have notes from former owners on them. Personally, I think they add to the value, although I'm sure "true" collectors would disagree. This pattern I spotted on ebay has, I think, my favorite notes ever! "This one" (I wonder why she picked that one? Maybe she was afraid that the other version would make everyone hunch over like the model.) 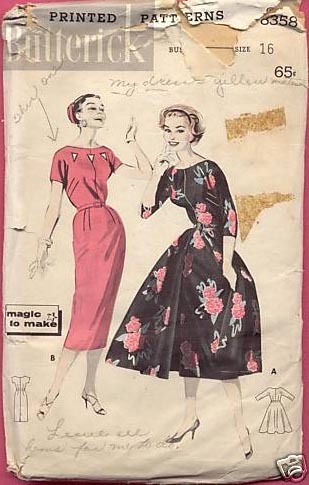 "My dress is yellow [something, I guess the type of fabric]" (I like the way she underlines "my dress") and finally, "leave all hems for me to do" which tells me that someone else was given this pattern and the yellow fabric to make the dress for our pattern owner. I've often wondered if pattern notes were for the owner or someone else and it's interesting to see one where you can be sure. Anyway, this dress is not for me, but it's available on ebay (ends on the 6th) if you're interested! And I hope that your dress will be yellow, too. I'd guess that this pattern was used for bridesmaids dresses. She's telling the dressmaker whose dress is which colour, which view to use, and that she wants to hem all the dresses herself. I remember that in weddings in my mothers era (the 40's/50's), bridesmaids often dressed in different colours. The maid of honour often was a different colour and the rest of the bridesmaids either matched each other or were variations on the colour theme (i.e. pastels or brights) The reason I'm guessing this is that I have a bundle of patterns where the exact same wording is written on the envelopes and since they came from a family member, she explained the notes on the pattern envelopes and that they were used for her bridesmaids dresses. I think that makes perfect sense, AND explains why "hems" instead of "hem". I would not have thought of different color dresses for bridesmaids! All our family's photos are b/w and I never would have asked.